The best introduction to a talk I have ever heard was when I heard an African American at the Twin Lakes Conference begin his talk with the following words: “Well, here I am. A black guy. With 200 plus mostly white guys. In Mississippi. In the woods. It ain’t looking good!” I thought it was funny. As did, as far as I could gather, most of the people there. But what surprised me was that there were those who were not pleased. I’m not sure why. Did they not want to be reminded of the not too distant racist past of much of their culture? Did some of that still remain? Whatever the reason it was clear that the speaker had touched upon a still deeply sensitive issue. Over the past couple of days I have been reminded of that. It is a cultural thing. Most people in Europe would regard the article on The Alliance of Confessing Evangelicals which stated that ‘Socialism was evil’ as being right wing American hyperbole – see for example this reaction from Saints and Sceptics in Northern Ireland. But here is the surprise. There are many American evangelicals who are fed up with this kind of nonsense, and most of the reaction I have had from the US has been really positive. Those evangelicals who continue to identify evangelicalism with American Capitalism need to take heed that they are losing their own people. They need to understand that they are not losing them because of liberalism but because of this distorted view of religion and politics. However I thought I would finish this mini-series by asking, not “Is Socialism evil?” but “Is Capitalism evil?” As with Socialism let’s make sure we define our terms correctly. This is the mirror opposite of the definition we gave for Socialism where the state controls the means of production. Just as there are those who argue that Socialism is evil, so there are those who argue that Capitalism is evil. They cite the greed, the reliance on interest rates, the worship of mammon and they have no problem in identifying the commerce of today with the Babylon of the book of Revelation. Like those who argue that Socialism is evil, there is more than a grain of truth in what they say. But they are wrong, because the question is meaningless. I am not going to go into the various merits of these two particular economic systems, because that is a political, not a moral or theological argument. Evil is what is in the human heart, not the economic system. To put it another way, I think that the capitalist system, if perfect human beings ran it, would be a perfect system. If perfect human beings ran the socialist system it would also be a perfect system. Neither system is per se evil. Neither system will ever save us. For Christians to put their faith in a particular political/economic system or, when that system is criticised, to act as though blasphemy had been spoken is, to say the least, an unbiblical distortion. At a practical level I personally don’t care if the State is running the train company, or a private millionaire, as long as the trains run on time, the workers are well paid, health and safety are taken care off, and the opportunity to travel is given to all. In reality most countries are run on a mixed economy; government does some things better, and private companies do others. Where the balance lies is in biblical terms ‘adiaphora’ (things indifferent). It is the job of government to ensure that there is justice and peace; a level playing field, provision for the poor, protection for the weak and limits placed on the powerful. So lets come back to the main issue here; the identification of one system with Christianity. I could of course write about those who identify Christianity with Socialism but since that is not the article I am responding to, please take it as a given that the same standards apply on the other side. I am not writing in defence of Socialism. I am arguing in defence of the Gospel. And this is the really important issue. I am convinced that there are sections of the American church who have got caught up in the whole culture wars thing and as a result they read the Bible through the eyes of their culture, rather than read the culture through the eyes of the Bible (a danger that all of us can fall into). An example of this is the way that some Christians are for government restrictions on abortion but are fanatically pro-choice when it comes to money. The pro-choice feminists argue for human autonomy when it comes to the human body – “It’s my body and the State does not have the right to tell me what to do with my body!” Christians rightly point out that God forbids murder of human beings and the child in the womb is a human being and look to the government to restrict the practice. However, those very same people will then be pro-choice when it comes to money – “It’s my money and the State does not have the right to tell me what to do with my money!” Do you see the inconsistency? Just as God has ordained the body, the family and the church, so he has ordained the State and he has commanded us to pay our taxes to support that State. This is the teaching of the Bible. Rick Phillips and R C Sproul Jnr. and those who follow their line of argument, demonstrate an anarchic spirit totally alien to historical Calvinism. In the Institutes (4. 22. 20: Of Civil Government) Calvin argues that taxation is necessary for the public good, but enters a caveat that the prerogative ought not be abused by rulers for personal aggrandisement. Similarly, John Knox had no inhibitions regarding the legitimacy of taxation (called Tiends in Scotland). He not only approved the use of parish tiends for the support of the poor, the upkeep of parish schools and the ministry of the church, but also sheltered the poor from heavy demands passed on by landlords in increased rents to cover their own tax obligations. He approved the principle of progressive taxation of the rich and argued for the removal of tax exemption bestowed on some of the wealthy by favour of the Queen. Knox’s approach to taxation laid the foundation of Scottish Calvinism’s historical commitment towards social and political justice. It fits the populist philosophy of Donald Trump, ‘only a fool pays taxes’, but it is not the teaching of Christ. Are we Christians or Trumpians? As I indicated, this is a serious issue facing the American church. If we do not deal with the heresy of associating Christ and his Gospel as being synonymous with free market Capitalism, then the US is going to go down the tubes even faster than the UK did. People have to see that the choice is not between political/theological liberalism and political/theological conservatism but that there is another way; Biblical, Christ centred theology at the centre with varied political views at the periphery. You cannot be a Christian and hold to a liberal theology because the liberal Christ is no Christ at all. However, you can be a Christian and hold to a conservative, socialist etc. politics. What is needed here is not just quiet agreement (“We agree but we have to keep quiet because there are wealthy people in our congregation/network who will get upset and withdraw their support if we dare to challenge”) but robust, Christ-centred challenge. It’s all very well denouncing the heresies from the past and the heresies in other churches and groups but it just becomes hypocrisy if we don’t have the guts to deal with the heresies in our own midst. Thank you for this. I was amazed at the article as well–and it was obviously designed as a slap at one of our Presidential candidates. What was ironic is that Rick had a day previously written an article on the Ref 21 web site on the spirituality of the church as a way of countering some in the PCA who have been vocal on the issues of racism in the PCA. We should show care and respect to all sides. the mission of the church – which its organization and activities should reflect – is evangelism, discipleship, and church building. This is the great work of all history to which we are privileged to be called. There is no evident biblical basis for the church to add other missions, such as social justice, to the commission given by our Lord himself. If only Rick had heeded his own advice! As it stands it looks as though he is telling the church to stay out of politics, social justice, etc when it comes to racism, but when it comes to Socialism the church should be denouncing it as evil and praying against it. It is, at best, a somewhat skewed message and it does not read well for the PCA or for the Alliance of Confessing Evangelicals. ACE have not only allowed this on their website, but as they have also not allowed any corrective to it (I am quite happy for them to post my articles if they wish! ), then they are implicitly endorsing this distorted message. 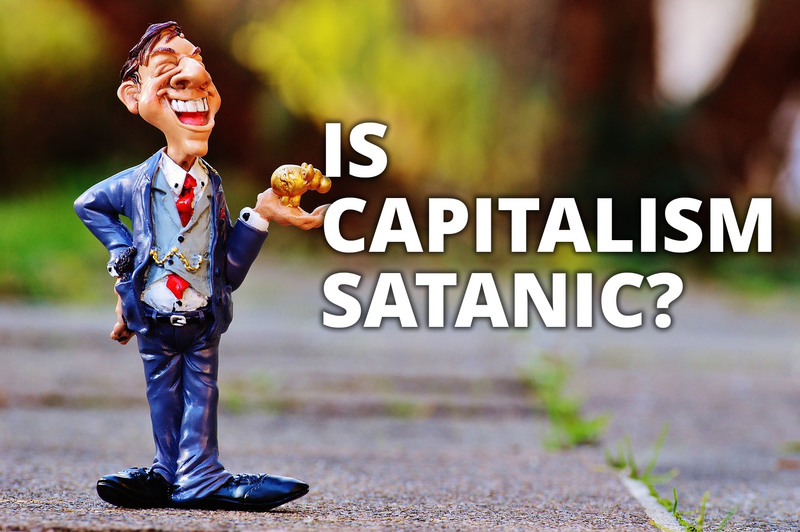 Part 1: Is Socialism Satanic?– Why has the Alliance of Confessing Evangelicals gone all Political? Part 2: Is the Church Capitalist? Is the American Church too Compromised with the Culture? Without getting into the efficiency of markets and that everything is capital, what is interesting is that the UK and USA, through worshipping the stock markets, have essentially created socialist societies whereby everyone with a pension owns the great public corporations, but none of us have any power over those companies since our money is abstracted several layers deep through various funds, fund managers and boards of directors. 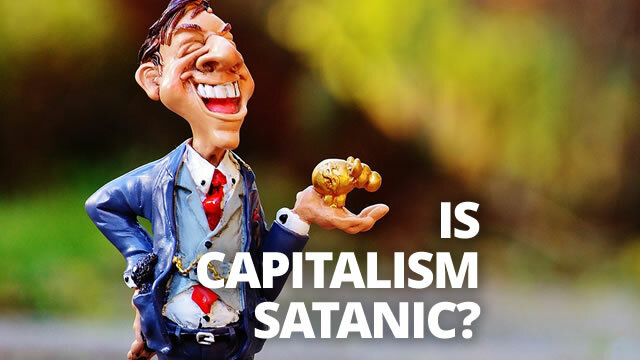 Pingback: Is Socialism Satanic? – Why has the Alliance of Confessing Evangelicals gone all Political? Pingback: Is the Church Capitalist? Is the American Church too Compromised with the Culture? David, Good point on the evil of human hearts in all systems. To your points about the government enforcing an even playing field, I would add: enforcing contracts and preventing damage or harm to neighbors. This is best accomplished by not concentrating too much power in the hands of a few, which socialism and all government run economies do. Socialism is more conducive to totalitarian evil, that is costly or impossible to overthrow or escape. For example, if I get bad service from Federal Express I can use a competitor, or invest in a start-up to compete. However, if the Postal Service is government-owned and given a monopoly for the public “good” we all will certainly experience lousy service, high costs, inefficiency, increasing taxes to subsidize, and greater poverty as a result. It is not because Fed Ex people are less evil in their hearts but the free market system incentivizes them to provide good service at the lowest cost, or they lose their investment/jobs. I also don’t think you addressed the ethical question of ownership or stewardship that Phillips raised. The idea that a workman is worthy of his wages, that he is entitled to, and responsible to God for the use of what he has produced. For the state to pass a law that it can confiscate and control an industry, farm, bank account etc. is to take the place of God, to steal, in violation of the moral law. A limited amount of taxation is necessary, but the problem is evil means governments grow and want more and more until they own or control everything. It is also beyond the competency of any human organization to direct an entire economy or to create wealth, they only take and spend, ultimately impoverishing the people. See Eastern Europe and Russia under communism and every other socialist government, even the Scandinavian ones (Finland now has 15% unemployment) eventually extinguish innovation and incentive to work. Phillips made a ethical argument that you avoided, by branding him a zero taxation advocate, that is not true. There is a fundamental ethical sin in the socialist theory, called theft. We can argue where the line is crossed in terms of level of taxation and control, but there is a line, Thou shall not steal, applies to governments as well. I’m sorry I don’t have time to reply to all your points but let me keep it to a few. 1) It is naive to think that government control automatically puts power in the hands of the few (after all government are elected and responsible to the electorate) whereas capitalism puts power into the hands of the many! Not in todays world – where the super rich and the corporations are getting fewer and more powerful! 2) The workman is worthy of his wages. Taxation is not however ‘confiscation’. 3) Yes – governments want to control everything – so do corporations and individuals. Its incredible how much these extremist right wing conservatives don’t believe in Total Depravity – just government! But of course you miss the main points of my critique – that identifying the Gospel with one political/economic system is unbiblical and wrong. It is also suicidal for the Church – as you are now finding out in the US. David, Good points but I think you are conflating two questions. Socialism is State ownership of enterprises that could be private and free market based. There is a legitimate debate about what government functions should be. Rick Phillips is ex-Army and I would bet he is not for privatization of defense, for example, and I don’t think he believes taxes levied legally for legitimate (i.e. Constitutional) purposes are wrong or confiscation, nor do I. The legitimate purposes of taxation is one question, but your article is about Socialism, which Phillips and I oppose on moral and ethical grounds. However you counterattack on a strawman that we both somehow believe all taxes are illegitimate! Not true, and while it is a tactic in debate, not a fair one. Yes, the corporate interests use influence in gov’t to eliminate free markets and competition. But the worst solution would be to throw up our hands and allow the state to monopolize all industries and services, from few options to one. My Fed-Ex Postal Service comparison writ large. I agree the government should not favor the large corporations but it is naive to think that any large government is not going to be most influenced by the rich and powerful. Including every socialist government, see National Socialism in Germany or Communism everywhere it has been attempted. Oligarchies all. The US Constitution, now almost forgotten, was based on decentralization, small government and maximum liberty. Here in the US we still have the remnant of a view of civil government that I believe is not part of the Gospel, but is more biblical than socialism. And which by the way we learned from Scots like Samuel Rutherford, Adam Smith, Thomas Chalmers, and even William Wallace. If you want to live in a state-owned and run society, there are many to choose from. But people emigrate from all of them by the millions, almost always towards capitalism, imperfect and corrupt though it may be. I assume we will agree to disagree, but surely we can agree there are some legitimate boundaries of state ownership and power? It is not a gospel debate to delineate the boundaries, but a biblical debate to define them. Church and State? Family and State? Work and State? I think the Bible speaks to those questions, and I believe you and Phillips believe that too. I find it interesting that Americans keep repeating the mantra that because everyone wants to come to America and flee from socialist countries that somehow justifies capitalism as more biblical! The premise itself is false – there are far more refugees trying to get into Sweden than out of it….and no…we don’t all want to flee Scotland for paradise! I wonder how Americans have come up this false notion. However I do agree that there are boundaries and limits to both State and Church power – personally I think that Calvin got it right but in todays American evangelical world he would be condemned as a European socialist! What I find depressing about this series is the evil it brings out in me. Thank you for emphasising that David. 1 Over the years I have largely “self – taught” the theology of the reformation, wrestling with myself to conclude that the 5 points of calvinism are scriptural, and hold together like the digits on one hand. But what I’ve struggled with is the personal vitriol and haughtiness, self aggrandisement and self-justification in what passes as debate – the sheer captiousness of much of it – the lawyerly adversarial positioning and argumentation. Pharisaic. So I fit in well I suppose. It brings out the worst, the pharisee, in me. And I don’t like it. 2 When I first first became a Christian, I couldn’t quite take in how many doctorates there were in the church and why. Perhaps there were more than in medicine, the law or other professions. Is it to invest with authority both inside and outside the church? To make or become a name? To become a profession rather than to make a profession…of faith? To give a voice? Great for the building up of the church, but destructive when it results in intellectual sparring in the name of theological or scriptural soundness. 4 But I’m almost irritated that Calvin has to be quoted, almost “bowed down to” as it were. 5 Why? Because I think goodfeltg’s excellent post today in Part 2 of this series is so basic, so obvious, it ought to be as “plain the nose on the faces” of prominent theologians, who live “between two worlds”, of the Kingdom of God now, but not yet. 6 And as for the idea of tax being theft. Someone help me here please. Does the bible define theft? Those who say taxation is theft don’t define theft. I could give an England and Wales “authority referrence” – section 1 Theft Act 1968. It includes “dishonest appropriation”. Yes, “dishonest”. The collection of tax is according to the law, that is legal, not dishonest. “Appropriation” is “treating as your own” . Dr. Ross’s quotation of Calvin is directly on this point. “Appropriation” may or may not be coercive. In fact coercion is lawful and needful, in many fields of the administration of the law. But the collection of tax is rarely by coercion and where it is it is lawful. 7. I know, I know. Why do I comment on this blog at all? It makes me examine my motives. It reveals my heart, brings out the things of which I accuse others, brings out the sin, the evil in me. And I don’t like it. I’m sure that there will be many esteemed Christian lawyers who would be able to have a delicious debate with you about law and morals which you will be aware has exercised the not only the church but the law down the centuries, but to align the reformation with a particular political theory I think is to do it a disservice, is an overeach and risks turning imperatives into indicatives. It would at the same time repel or attract those of a particular political stripe whilst being oblivious to scriptural gold, the good news of Jesus, so laboured over at risk of life, and dug out by the reformers. If the reformation did so align I wouldn’t touch it “with a barge pole” if I knew nothing about it and weren’t a Christian. It is easy to make false points from extreme examples. Are you saying, for example that in this country (England) Compulary Purchase Orders (with financial comensation) to take over private land to build a railway or road or airport is “theft” ? But it is alright for an idividual to buy private propery to build a private airport, wherever they pleaseAre not the intention and purpose relevant, with checks and balances? But I don’t want to make a false point. What about commercial firm buyng apartments and coercing individuals to leave, so the land can be developed? Is there a moral/ethical equivalence? Is this overly simplistic? Again I come back to stealing. In criminal law (not morals,(though clearly there is a moral aspect to it) in England and Wales there has to be “mens rea” ( a criminal intent) as well as “actus reus” (a criminal act) . And a crime is is an act against the Crown, the state, society. Am I wrong to say that “intention” is very important to God. I’m really disappointed that you seem to be focussing on commerce to make politcal points. What about all those other spheres of society, What about other moral and ethical issues ,law, greed, resposnsiblity of wealth, responsibilty of employers all the imperatives that flow from the indicatives, and other biblical issues that have been mentioned in posts in parts ! & 2 of this series. By the way can you give me any pointers on how to vote on the In/out European referrendum? I’m sure David will have something to say..Not keen on simply relying on Obama’s endorsements. Thank you, David. Please pray for us, the Reformed church in America. Some of us are swimming against the tide when it comes to these matters. And I expect it will get worse, not better, as election season draws near, with all the rhetoric we get over the airwaves. Unfortunately, some Reformed spokesmen who associate the Gospel with capitalism are in charge of some prominent and powerful Reformed ministries. We need more voices on this issue. If you would indulge me further David, but if not, don’t. I read an article within the last few days by John Piper. He was greatly encouraged by both Clinton and Trump. No mention of their policies. So why? He was encouraged by their age. It was an example to all able bodied Christian oldies. (my words). An application of biblical imperatives, of reformed theology at it’s best perhaps? An interesting article as ever. I would like to pick up on a few points that you have raised. I agree with your point that both Socialism and Capitalism could be perfect economic systems if perfect people designed and ran them and as you point out we are all fallen, so that will be an illusive reality. With that said then, shouldn’t we as Christians seek to favour a model that produces the greatest amount of freedom and choice, for us to have the liberty to reach out to non-believers? As a fellow History graduate, I am sure you will acknowledge that freedom is inexorably linked to Capitalism. Socialism on the other hand, through state bureaucracy, requires the political and the economic to become inextricably linked. This kills freedom, choice and liberty to the effect that believers are less able and less free to conduct their lives in accordance with the Bible. In the USA this does appear that Christianity has become Capitalised in some quarters. However we should have the humility to appreciate that they probably take a look over the pond at us in Britain (Scotland) and see how Christianity has become pulverised by the State (Both the UK Government and the Scottish Governments). As a result we should hardly be surprised when they are doing everything in their power (sometimes wrongly) to maintain their power and influence. I suspect that this is why Donald Trump is making headway in the Republican nomination. However we should not make a false dichotomy that you are either a Christian or a ‘Trumpian’ – the two are not mutually exclusive. Today it is sadly the case that most left wing parties do not leave very much room for Christians. Central to their agenda is the systematic deconstruction of Christianity in public life and this can take many forms. Parties on the right offer at least a stand against these issues or at least the slowing down of these events until the tide is too great to resist the change. The identification of one system or party with Christianity in the USA means that it has influence and clout in public life. In the UK the dilution of the Christian vote across most parties has rendered our voice insignificant, if not pitiful. It is still socially acceptable to go to church in the USA whereas over here Christians have become a pariah in society. Just look at the reaction to the appointment of the BBC’s new morning presenter Dan Walker as a case study. Has our approach not done more damage than identifying with one particular system? As you pointed out it is imperative to read the culture through the eyes of the Bible and not the other way round. Let us pray that this is increasingly the case both in our society and in the USA. What a painfully short-sighted analogy. Your money does not suffer injury or death if mismanaged. Christians in government who work towards restrictions on abortions do not do so out of some totalitarian desire to place oppressive controls on women. They do so to save a life. And protect a woman in a state of high anxiety from making a rash decision that may haunt her for the rest of her life. That’s why people want to make it very difficult (very few actually believe the government should make it “impossible”) to procure an abortion. In what unearthly dimension is saving a life analogous to collecting taxes (regardless of whether those taxes could be considered oppressive or fair)? The government should save lives. It should also collect taxes. But if you tell me my taxes collected are going to directly fund abortions and if I don’t willingly relinquish those tax payments I will lose my home, my possessions and/or my freedom… well, that news does indeed put a smile on Satan’s face. Joy – its not an analogy. Its a direct comparison. People who argue that the government has no right to tell me what to do with my money, cannot then logically turn around and say but it does have the right to tell me what to do with my body….And yes governments should not use taxes to fund murder. One problem I see in many of the comments (as well as in the article on the ACE site) is the assumption that socialism always exists in its most extreme, abusive forms. That’s like assuming that capitalism always exists in its most extreme and abusive forms. From this follows the complete failure to distinguish between the communism of the Soviet Union and its dependencies, now fortunately a thing of the past, but still extant in some Asian and Latin American countries, on the one hand, and the democratic socialism that dominates much of Europe. Firstly, as David’s definition of socialism shows, it is not always about state ownership but more often than not about state regulation — that also exists in the US system, i.e. in the form of antitrust laws, trading standards, etc. Of course there is private property all over Europe, even of businesses. Secondly, the level of taxation to pay for social benefits is set by democratically elected parliaments — how can one possibly argue that it is theft? Thirdly, in all countries dominated by democratic socialism one typically can still achieve more wealth by working, doing business, etc (if one is able to) than by simlply collecting government benefits. Those who cannot would struggle in the US as well, and there their poverty would be more dire because of the lack of benefits. It is that type of democratic socialism rather than communism which Sen. Sanders advocates, by the way. This is one of my beefs with Capitalism, although i have issues with ANY form of government. The real problem we have is corporatism. Basically under the specific type of capitalism we have, LIFE is conflated with money. The working class are forced to prostitute their time/lives out for money instead of selling what they produce. Their LIVES are given monetary value. When you go into a court system, or deal with an insurance company, the government and the insurance company view YOU as a commodity (a human resource) and your life is assigned a monetary value. Many corporations operate from the principle of maximizing profit regardless of damage caused to society, and they are never held accountable except of PAY money to replace a life…that is the cost of doing business, and none of the executives are held responsible, because they are only there to maximize profit. The shareholders are not held to account because they appoint the board to run the corporation. NO ONE is held accountable. Corporations are sociopathological organizations THAT HAVE NO ACCOUNTABILITY and run at enormous costs (externalized) to society and have infected all organs of government. Not “capitalism” or “socialism” per se but the actual fact that we have let completely authoritarian, pathological institutions called corporations to flourish at our expense. I’m sorry but you are making a fundamental mistake in your generalisation – Christians do not teach that it’s my money and the state does not have the right to tell me what to do with my money. Jesus taught about taxes – give to Caesar what is Caesar’s and to God what is God’s. Sorry, forgot to add, i am no longer a christian. Previous Previous post: Is the Church Capitalist? Is the American Church too Compromised with the Culture?